Yes! 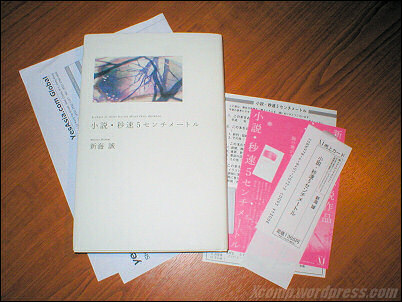 The 5 Centimeters per Second novel has finally arrived from YesAsia after much waiting and trying out many ways to get it. I was expecting one of those smooth covers judging by the image retailers have up on their sites but, the cover outside the hardback book is actually a rough one. 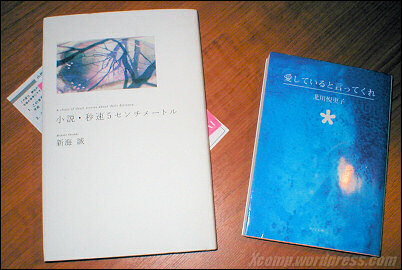 The book is bigger than the other regular paperback Japanese novels I have but is also about twice the price. 1300 Yen (US$12) instead of 500 Yen (US$5). I guess it's kind of expected from a hardback book. 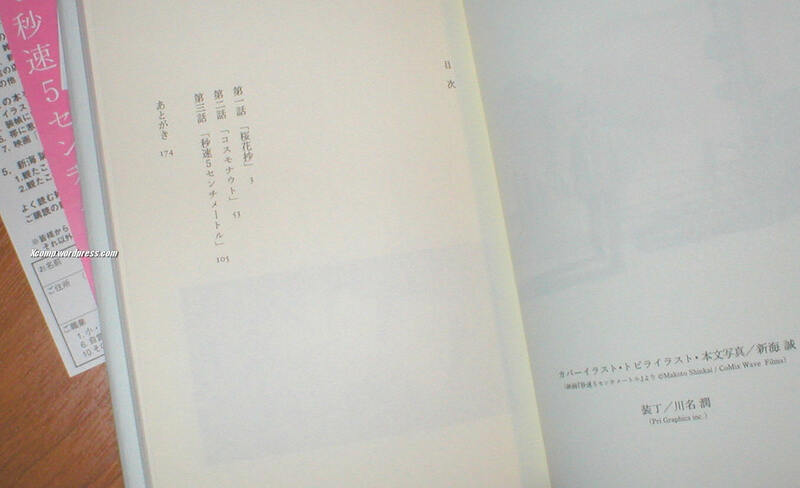 Its size is roughly about the same as a regular Western novel over here. Paper quality also feels more durable. 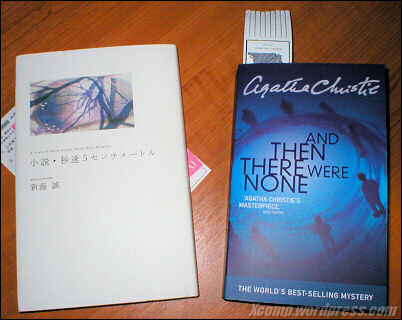 For those of you who can read Japanese (or at least a Sino language that helps you guess the meaning), I didn't buy that small blue novel. 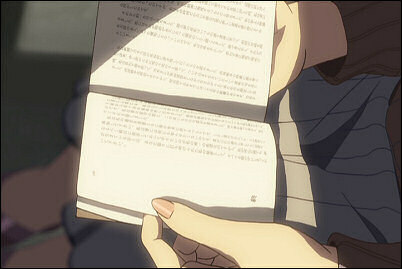 A penpal gave it to me and is a romance about a girl who falls in love with a deaf artist. It was made into a popular J-drama I heard. As much as I want to read the novel right now, I can't because I've still got a few exams lined up and really have to be studying for them. What I did do was give it a quick flip through and found it doesn't have any sketches along side the text, unlike in the serialised version published in Da Vinci a while ago. I don't mind about that since it's the story I'm after and will be looking forward to it. I don't know why regular Japanese novels are made small. Maybe they like to make them compact to save space in the house or so it's easier to travel around with? 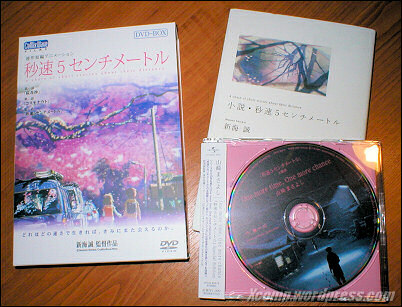 So, I now have the complete set of 5 Centimeters per Second related works - the limited edition box set, the novel and the theme song single. No time to gloat, though. Must get back to studying. I kind of wanted to have the sketches as well. If I buy secondhand off Yahoo Auctions, it comes up to ~2000 yen, which isn't that much more than 1300. Or that's what I'm telling myself, anyway =P. Hmmm, why not just import the whole novel from HMV Japan? It should be issues 157 to 162 according to Shinkai's site. Do you happen to know which issues of Da Vinci the serialised version was collected in? I'm hoping to try and order a full set off Yahoo or something. No problem, I'm always watching out for comments on older posts anyway! In fact, thanks for taking the time to comment! Yes, I'll be comparing the novel with the movie once I get round to it. Probably once my exams finally end this week and I have one less thing off my mind. It should be a very interesting read. Very eager to see what wasn't in the movie! Sorry for the late comment (ugh, blog backlog), but I assume that you'll be covering the novel when you finally get around to reading it? I'll be looking forward to it then. Keep up the good work! Yes, I've been using YesAsia for several years now and most of the time they've been reliable. For "rare" (i.e. unpopular import) items that are labelled "Usually ships within 7 days" or longer, you might find yourself disappointed. They ended up cancelling my orders a few times because they couldn't find stock but fortunately, they don't charge your credit card (unless you're paying by Paypal) until the item is dispatched. So it's still worth a try. If you do decide to order it, I think you maybe only a few dollars away from free shipping depending on where you are. I suggest looking around the site for something else that's worth whatever you're going to be paying for shipping since you're going to pay that anyway. Hello, I stumbled on your blog while searching for more info on this film and I appreciate all that you've posted about it. I'm about to start my 3rd semester of Japanese but my reading comprehension is abysmal (I need to learn a lot more kanji). 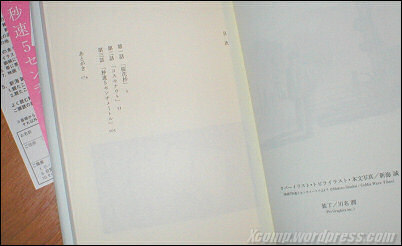 Still, since there's not much hope of this being translated I may just buy it anyway and use it as a study incentive. I've never bought anything from yesasia before, are they reliable? $18 before shipping is more than I want to pay but I'll probably shell out regardless .